MSEEMP '97, is vice president of North America manufacturing for Ford Motor Company. He is responsible for Ford's North American manufacturing footprint - the company's largest in the world, with more than 30 manufacturing plants. Mr. Hettle plays a key role in Ford's ongoing efforts to improve manufacturing flexibility and efficiency, while also overseeing Ford's product expansion in North America and the company's seamless conversion to global platforms. 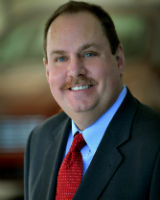 Mr. Hettle joined Ford in 1986 as a process engineer working on vehicle launches, and has spent his entire career with the company in manufacturing. Since 2008, he has led Ford's manufacturing engineering group as executive director, global vehicle operations manufacturing engineering. In addition to other leadership roles, he served as director for Ford's Manufacturing Business Office, and was plant manager for Wayne Stamping and Assembly and Edison Assembly. He holds a bachelor of science in mechanical engineering from Oakland University and a master of science in engineering management from Wayne State.